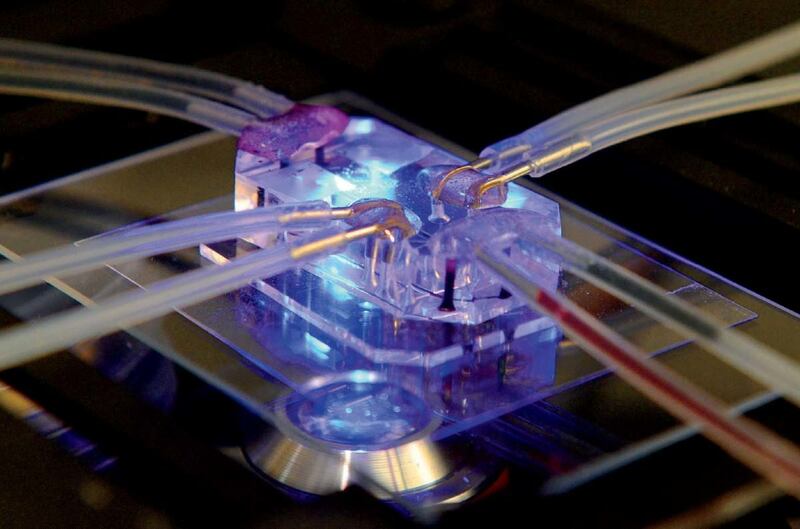 The lung-on-a-chip mimics the mechanical and biochemical behaviors of the human organ. The Wyss Institute team seeks to build and link 10 human organs-on-chips to simulate whole-body physiology. Could tiny, translucent chips that mimic human organs replace animal testing for drug development? That reality may be coming, according to researchers at the Wyss Institute who have developed organs-on-chips: flexible polymer microchips (about the size of a computer flash drive) that provide a window into the tissue structures, functions, and mechanical motions of lungs, intestines, kidneys, hearts, and other organs. Developed by Folkman professor of vascular biology and Wyss Institute director Donald E. Ingber  and Tarr Family professor of bioengineering and applied physics and Wyss core faculty member Kevin “Kit” Parker, these chips have potential to accelerate drug discovery, decrease drug-development costs, and create a future of personalized medicine to treat a wide range of diseases including cancer, liver failure, pulmonary thrombosis, and asthma. Testing drugs in animals has proven problematic due to fundamental biological differences, Ingber says, and the traditional method of testing human tissue in the laboratory can also be challenging, because cells often die or fail to work normally once removed from their context in the body. Instead of moving electrons through silicon, the contents of the translucent chips push small quantities of chemicals past cells from lungs, intestines, livers, kidneys, or hearts so any changes in the cells can be observed under a microscope. Networks of tiny tubes within the chips give the enabling technology its name—microfluidics—and let the chips mimic the structure and critical functions of organs, making them, in Ingber’s words, “an excellent test bed for pharmaceuticals.” Their lab has already developed chips that mimic the kidney, brain, liver, and gut, as well as bone marrow and the airways in the lungs. Organs-on-chips are still in their infancy, but Ingber explains that the micro-devices could transform personalized medicine, in part because they would allow researchers using stem-cell technology to build chips lined with the cells of people from specific genetic subpopulations. “Imagine you have a group of asthmatics who are female, belong to a particular ethnic group, and all have a higher sensitivity to smoke inhalation,” he says. “Maybe you could develop a drug just for that small group, using the women’s personalized chips.” If an apparent cure for their asthma is detected, he continues, that same group of women could be used in the subsequent clinical trials, speeding the drug’s approval. Ingber, Parker, and their team already have funding from the Defense Advanced Research Projects Agency to build a so-called human-body-on-a-chip: 10 different human organs-on-chips linked together on an automated instrument to mimic whole-body physiology. This would allow researchers to conduct experiments that are too risky for human subjects, and provide insight into how reactions in one organ affect another—crucial information for testing drug efficacy and safety. “If we can show the organs-on-a-chip are independently viable and functional for a month, then we can show organ coupling,” Ingber says. They have already been able to watch a drug be absorbed by the gut, see it metabolized by the liver, and then observe its activity in another organ. During the next year and a half, Ingber’s team will experiment with more linked organs for longer periods of time, culminating in the spring of 2017 with a test designed to determine whether all 10 organs can function together successfully for four weeks. Last June, the human lung, gut, and liver chips bested Google’s self-driving car to win the United Kingdom’s most prestigious design honor: the Design of the Year 2015 Award. That marked the first time the prize had recognized the field of medicine. It’s not just about “making a little chip,” Ingber explains. “It’s also developing automated instrumentation” and a system for linking the chips. The entire project, he says, is a tribute to the Wyss Institute’s ability to bring people who have industrial experience together with students, Institute fellows, postdocs, and faculty members to create something extraordinary.